The Clojure(Script) IDE that understands your code. Advanced structural editing, refactorings, VCS integration and much more, all out of the box. Love Cursive? You're in good company. 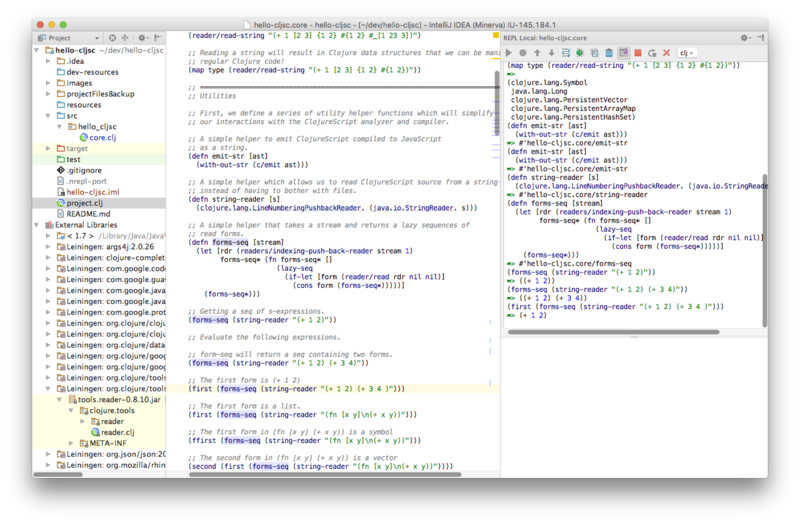 Cursive is built on IntelliJ, the most sophisticated Java IDE. Cursive contains all the functionality you've come to expect from JetBrains products, from project management to version control integrations across all platforms. Building on IntelliJ also provides in-editor inspections and seamless Java integration. Cursive is written (almost) entirely in Clojure, allowing us to easily integrate all the fantastic tooling in the Clojure ecosystem (for example, Leiningen and nREPL). And because we use Cursive every day to develop Cursive itself, we want it to be the best Clojure development environment around! Cursive is available as an IntelliJ plugin for use with the Community or Ultimate editions, and will be available in the future as a standalone Clojure-focused IDE. It is a commercial product, with a free non-commercial licence for open-source work, personal hacking, and student work. You can discuss Cursive and keep up to date with our mailing lists. Cursive is an Ideogram production.